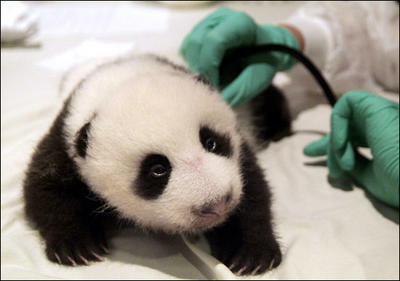 This is the baby panda at the Washington National Zoo. You can’t have him, because he’s mine, but I’ll share a picture. I watch him on the PandaCam. Once you start it’s hard to stop. I think I might have to visit him when I’m down that way. This is my first Dulaan hat. Three hours flat (er, in the round, actually). 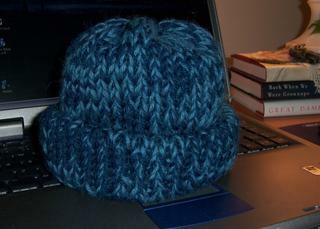 One strand Peruvian Highland Wool, one strand Peruvian Alpaca, size 13 needles. Easy-peasy, double-layered and everything! It’s official: I made it through the summer. I watch panda cam daily! Even worse, I keep all three open constantly…He’s just so cute! o my goodness. Panda cuteness. very sweet. Thanks.so glad you got through the summer.. now to get through till the retreat! Yay, glad you survived it! And oy, with the panda! And I thought baby penguins were cute.